Comparative genetic mapping in interspecific pedigrees presents a powerful approach to study genetic differentiation, genome evolution and reproductive isolation in diverging species. We used this approach for genetic analysis of an F1 hybrid of two Eucalyptus tree species, Eucalyptus grandis (W. Hill ex Maiden.) and Eucalyptus globulus (Labill.). This wide interspecific cross is characterized by hybrid inviability and hybrid abnormality. Approximately 20% of loci in the genome of the F1 hybrid are expected to be hemizygous due to a difference in genome size between E. grandis (640 Mbp) and E. globulus (530 Mbp). We investigated the extent of colinearity between the two genomes and the distribution of hemizygous loci in the F1 hybrid using high-throughput, semi-automated AFLP marker analysis. Two pseudo-backcross families (backcrosses of an F1 individual to non-parental individuals of the parental species) were each genotyped with more than 800 AFLP markers. This allowed construction of de novo comparative genetic linkage maps of the F1 hybrid and the two backcross parents. All shared AFLP marker loci in the three single-tree parental maps were found to be colinear and little evidence was found for gross chromosomal rearrangements. Our results suggest that hemizygous AFLP loci are dispersed throughout the E. grandis chromosomes of the F1 hybrid. 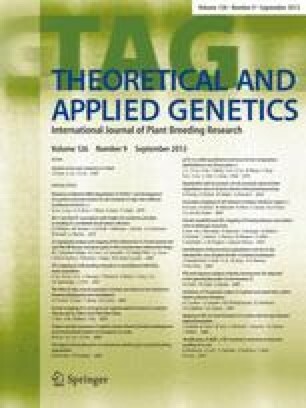 The authors wish to thank representatives of Forestal Oriental SA, Uruguay, and Forestal y Agricola Monte Aguila S.A., Chile, for providing the plant materials used in this study. We express our gratitude to Pablo Santini and co-workers of Shell Uruguay Renewables S.A. for the maintenance of the backcross families and collection of leaf samples for DNA extraction, Steve Verryn of CSIR, South Africa, for leaf material of tree G50, and Jane Harbard of Shell Forestry Technical Services, U.K., for the controlled pollinations that produced the backcross families. We thank Derek Harkins, Arthur Johnson and David O'Malley for valuable discussions, encouragement and technical advice; and David Remington and Claus Vogl for helpful suggestions during the preparation of this manuscript. This work was supported by funding from the North Carolina State University Forest Biotechnology Industrial Associates Consortium and by the National Institutes of Health (Grant GM45344-06). A.A.M. was funded by the Fulbright Program and the National Research Foundation of South Africa.